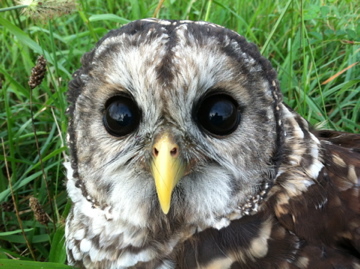 It’s hard to believe it, but on October 18th the Owl Moon Raptor Center Blog will be one year old! It’s been a great year too. Since launching, we have shared the stories of OMRC’s patients with over 5000 site visitors in 57 countries! We have learned quite a bit about blogging too. For one thing, it takes a LOT of time. 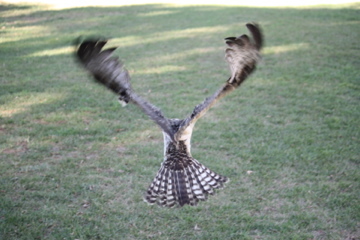 OMRC is the busiest in the spring and summer when young raptors are fledging and leaving the nest. It has been challenging for Suzanne to find time to write in between taking care of all of those birds, so starting this month we are going to try something new. We will give short, frequent updates on patients as they come in and developments occur. As time permits, we will tell longer more in-depth stories. We hope that this new format will make it easier for readers to follow along with the patient stories as they occur. Without further ado, let’s get to some patient updates! 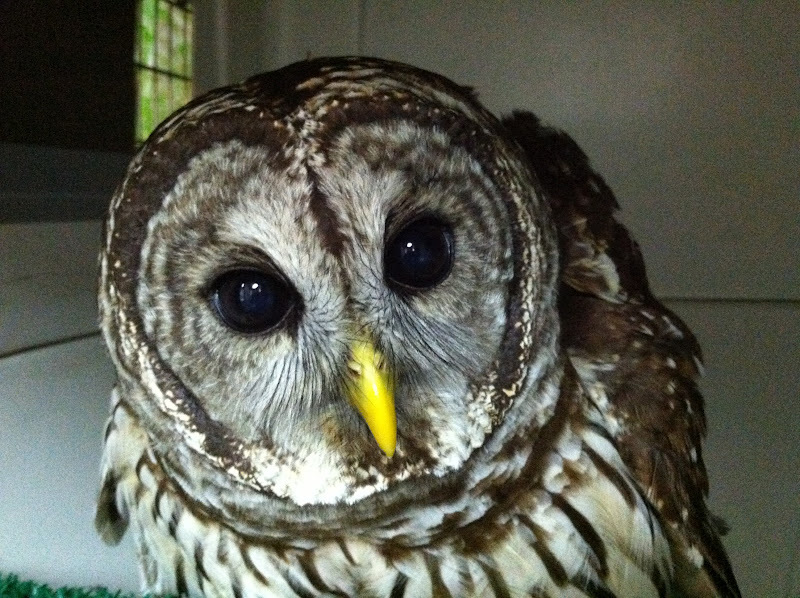 When last we wrote, Owl Moon was in the process of transferring Zen to Meadowside Nature Center in Rockville, MD. It seemed that his injured elbow would never heal well enough for him to survive in the wild. In the last few weeks, however, Zen has made a surprising amount of progress. After molting his damaged feathers and growing in a full new set, his flight is looking stronger and more even than before. It now seems possible that Zen might be releasable. If not, we will proceed with the transfer to Meadowside. We will give him more time to build his strength and complete his molt before making a determination. Bob has finally regrown his missing tail feathers, and is currently being reconditioned for release. Crooked Beak. Photograph by Suzanne Shoemaker. 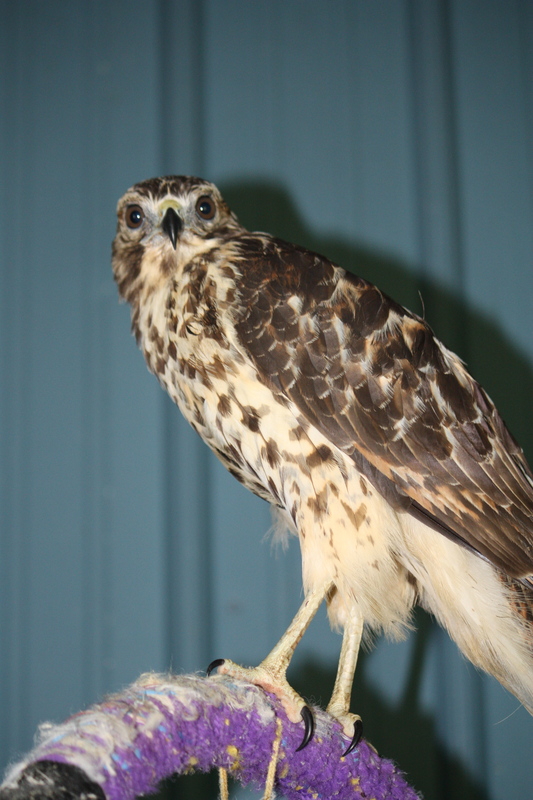 In the last post, we introduced you to Crooked Beak, a juvenile red-shouldered hawk with a misaligned beak. Great news! After considerable time and effort, her beak is back in alignment. She is currently being reconditioned in preparation for release. Little Bear. Photograph by Suzanne Shoemaker. Little Bear, another newbie from our last post, is also in the process of being reconditioned for release. When birds come to Owl Moon as juveniles it is important for us to test their hunting skills with live prey before returning them to the wild. Little Bear will be released on his home turf and we hope he will reunite with his parents. It is best for young raptors to learn to hunt with parental support, but their instincts are strong, and they can make it on their own. Henry. Photograph by Suzanne Shoemaker. 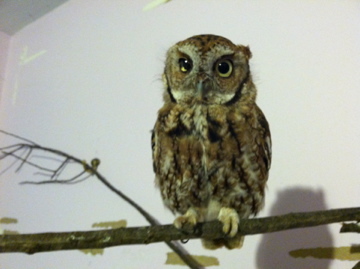 We have decided not to release Henry, the adorable young screech owl featured in last post’s videos. His damaged eye would make him vulnerable to predators in the wild and he would have difficulty hunting without the depth perception that two good eyes offer. The good news is that Henry will make a great education bird once a suitable arrangement is found. Kite. Photograph by Suzanne Shoemaker. 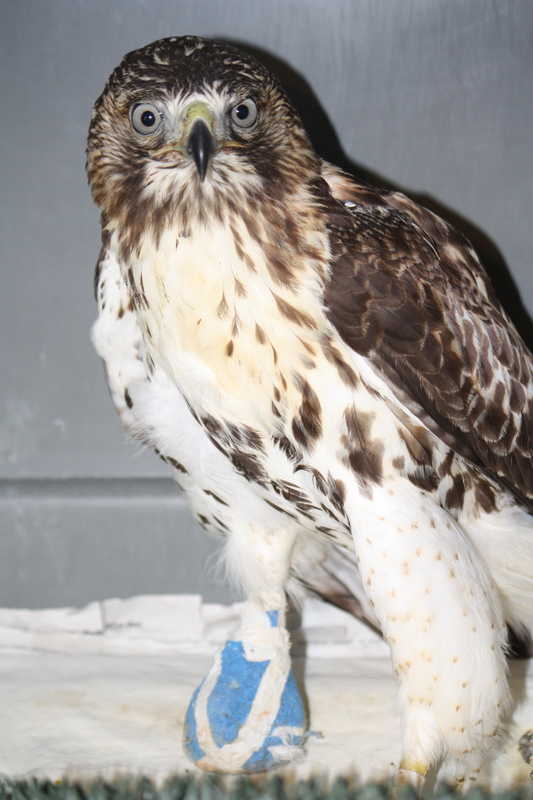 Another patient we introduced last time was Kite, a juvenile osprey found dangling in a tree with his toe caught in fishing line. We are happy to report that Kite’s injuries were minor. He was released where he was found in Edgewater, MD on July 25th. Many onlookers, including some of the firemen who rescued him, came to see him off. Plato. Photograph by Suzanne Shoemaker. Plato is a new patient at OMRC. He was rescued in La Plata, MD on July 22nd after flying into a window. When Plato arrived, his case looked grim. He suffered spinal compression from the impact. We treated him with NSAIDs, non-steroidal anti-inflammatory drugs, with analgesics for pain, for several weeks, while he slowly regained the use of his legs. 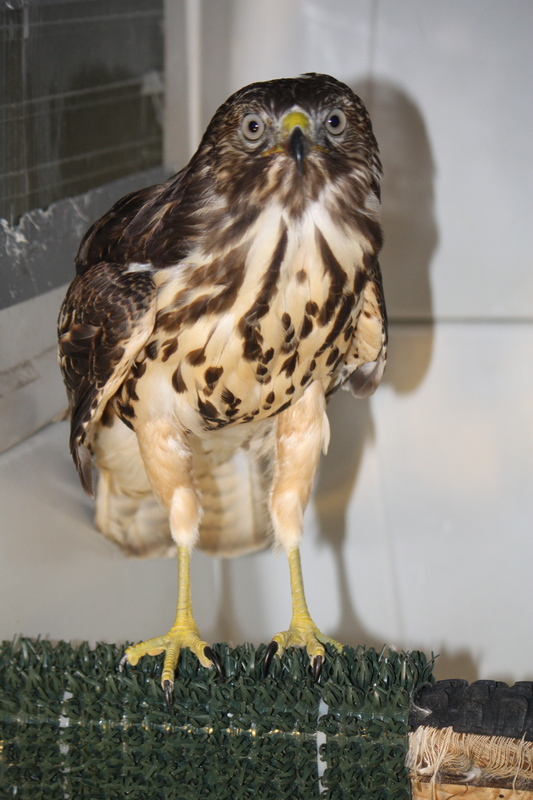 Plato is now able to stand, perch, and walk, though his legs are weak, and he sometimes rests on his hocks for support and balance. He can also fly. It seems that the spinal trauma affected the use of his legs more than his wings. We cannot yet determine Plato’s chances for a full recovery. His progress thus far is encouraging, but nerve damage can require months to heal, and he may never recover to where he can be released. 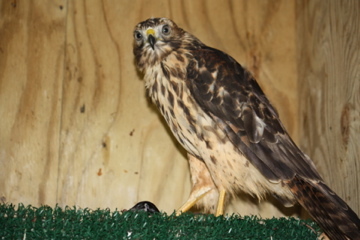 Unfortunately, Cooper’s hawks do poorly in captivity. If he does not recover fully he will need to be euthanized. We continue to hope. David. Photograph by Suzanne Shoemaker. David is another new patient. 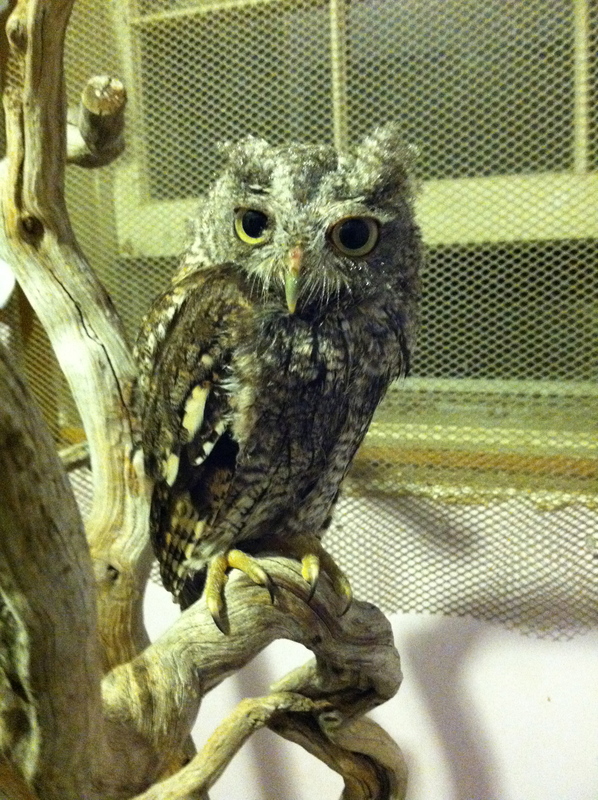 He is a juvenile male screech owl like Henry, but you will notice they do not look alike. Unlike most owls, screech owls come in two different colors. David is a gray phase screech owl. Henry is a red phase. David was found at Camp David, the presidential retreat in Maryland, and brought to Owl Moon on July 31st. He had a soft tissue (muscle and/or nerve) injury in his left wing and the damage appears to be permanent. He is not flying well enough for release at this point. We will seek an education placement for him if his flight does not improve soon. Pixie. Photograph by Suzanne Shoemaker. 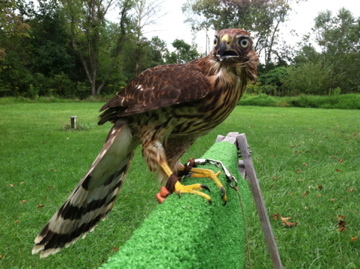 Pixie is a Broad-winged hawk. He earned his name by charming us with his playful peeping sounds and bouncing around in his cage when he thinks no one is watching. Pixie was found at Catoctin Mountain State Park on August 5th. He wasn’t flying, but he had no visible injuries. X-rays revealed a fractured coracoid. The coracoid is a bone that runs between the shoulder and the breastplate, and it is critical for flying. The bone has since healed, and we just started him flying on the creance line. His flight does not look good at this point, but there is still time for it to improve. Cleopatra. Photograph by Suzanne Shoemaker. Cleopatra came to Owl Moon on August 18th. She arrived unable to stand, uncoordinated, disoriented and lethargic. The symptoms suggest neurological impairment, probably due to West Nile Virus. Her prognosis looked grim, but day by day she has carried on. In Suzanne’s experience, adult birds seem to fare better against the disease than juveniles, but it is still devastating. Cleopatra is one tough bird though. She has regained her ability to perch, she is eating on her own, and she has her great-horned “attitude” back! Nothing is certain at this point, but her strength is definitely working in her favor. Summer was found near the Pennsylvania/Maryland border. He came to Owl Moon through a fellow rehabber, David Coppersmith. Summer’s symptoms indicate West Nile Virus. His condition is improving but we are worried that he might be permanently disabled. He eats, but he doesn’t recognize food until it is waved close to his face. His vision may be impaired as a result of the virus. Suzanne has an appointment to take him to the vet for examination. 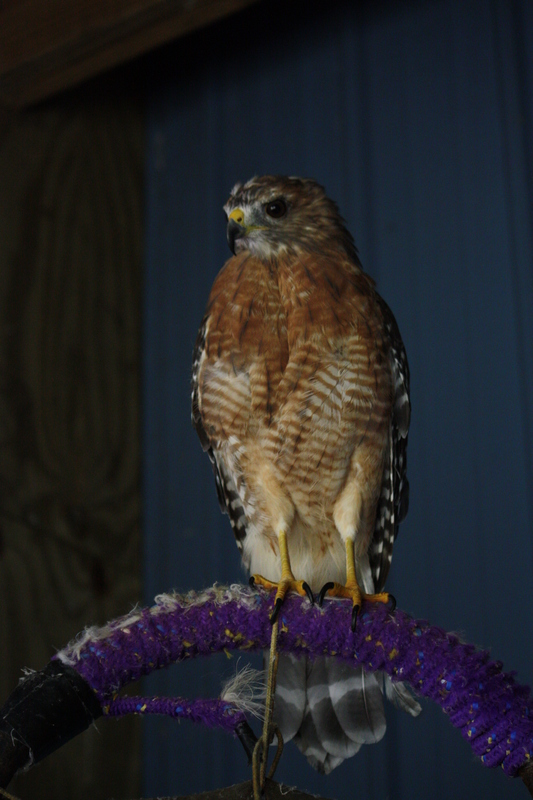 For now he has joined the other red-shouldered hawks in the outdoor mew, but is receiving extra attention. Beastie Boy. Photograph by Suzanne Shoemaker. 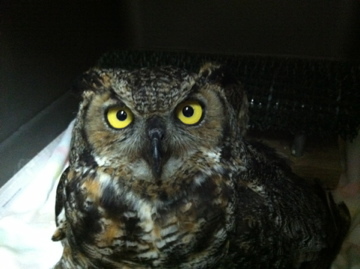 Beastie Boy was transferred to Owl Moon from Second Chance Wildlife Center on September 7th. 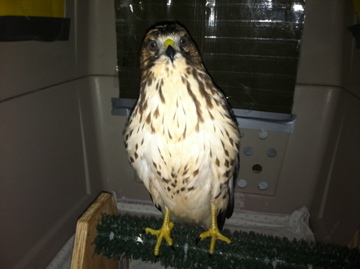 He collided with a car when he flew up from a roadside deer carcass he had been feeding on. Second Chance treated Beastie for a deep laceration on his left shoulder and a fractured hallux (back toe) on the right foot. The shoulder wound has healed, but it remains to be determined if he can fly well enough to return to the wild and hunt. We hope so. Beastie is not content to remain idle in his cage while his fractured toe mends. Duck. Photograph by Suzanne Shoemaker. Lastly, there is Duck. Duck isn’t actually a duck, but he was found in water. He was discovered clinging to the side of a horse trough in Jefferson, MD, on September 7th. He was close to drowning when he was rescued. Duck is another suspected case of West Nile Virus (WNV). He appears off-balance and uncoordinated, and these symptoms of WNV can cause birds to wind up in predicaments they would normally avoid, such as landing in a horse trough. He is receiving Non-Steroidal Anti-Inflammatory Drugs, the standard WNV treatment, just in case. He is doing well so far, but it is too early to tell.